During my childhood Germany was the home of beer. The mere mention of the country evoked visions of jolly bearded men in lederhosen clinking their overflowing steins and swaying back and forth to Bavarian folk music. It wasn’t just any beer either, I’d heard they had “dark” beer which, for the delicate palate of rural Minnesota, meant a truly undrinkable draught. 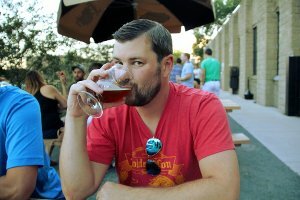 I didn’t develop a taste for beer until we were planning our honeymoon in Europe. Our itinerary would bring us to Munich at the start of Oktoberfest, and preparation for that trip was the catalyst for the love of craft beer that would follow. On that trip we were lucky to get a table in the Augustiner tent and it was one of the most surreal experiences of my life. After returning home I could confidently report that those visions were real. There really were men clinking their glasses and dancing on tables, women too! They had vast beer gardens, dense beer halls, gigantic pretzels, and beer steins as big as my head. The craft beer explosion was still bubbling back home and I left thinking that these Germans had a huge head start. Their whole culture was built around beer. It was more than a past time, it was a a ritual embedded into the fabric of their society. We had some catching up to do, or so I thought. 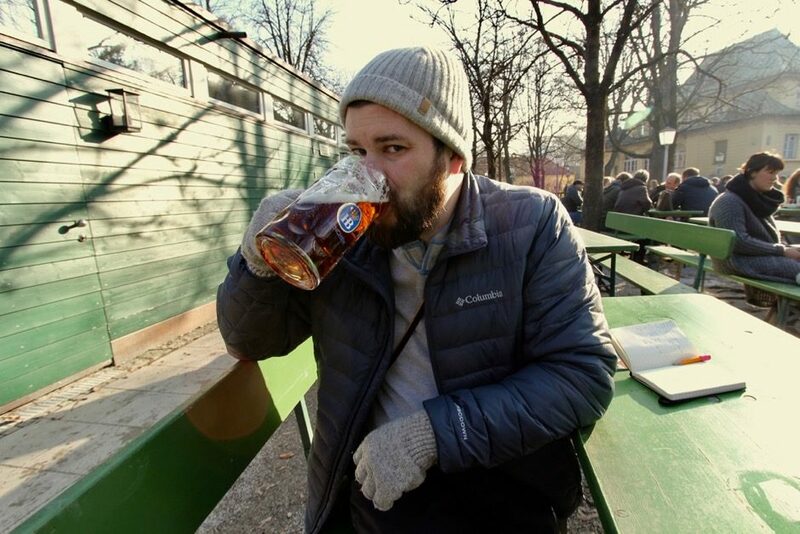 While planning our second trip to Munich, this time in chilly February, I was firmly entrenched into my craft beer journey. I didn’t write about my last visit and I was bound and determined to make up for it this time. The only problem was that googling “craft beer in Munich” didn’t get the results that I’d anticipated. After a bit of investigation it was clear that the home of beer was a little stuck in their ways, and it all boiled down to one word: Reinheitsgebot. The Reinheitsgebot or, more simply, the “Germany Beer Purity Law” can be traced to a law implemented in 1487, just around the time Christopher Columbus set his eyes on America. It then spread across Bavaria and the rest of the country in the early 1500s. The law states that only three ingredients may be used when brewing beer: water, hops, and barley. Yeast was added later since the original law precedes the knowledge that it existed, and it’s been tweaked for modern day to include malted grains in addition to barley. There were many additional rules and reasons for the law, but the result was the same. Beer quality got much better but the range in styles was severely limited. Traditional Bavarian folk music at the Hofbräuhaus Beer Hall. For that second visit my sister in-law, her husband, and my brother in-law were accompanying us. Two craft beer lovers and one transitioning craft beer lover. Because of this, our itinerary for each day was replete with sightseeing followed by a full night of drinking. I’d loosely planned our trip to hit beer halls of as many of the six main breweries as possible: Augustiner-Bräu, Hacker-Pschorr, Hofbräu, Löwenbräu, Paulaner, and Spaten. Munich is dotted with all manner of restaurants and beer halls owned by these institutions but each of them carry extremely similar beers. Locals each have their favorites but you can only have so many Helles, Dunkel, and Weißbier before they start to blend together. There are a bevy of other styles, Schwarzbiers, Kellerbiers, and Kölsches but at the end of the day it’s still primarily cold fermented lagers. It’s certainly commendable that they get so much variation within that style but I can’t help but think that the purity laws are restraining their creativity. 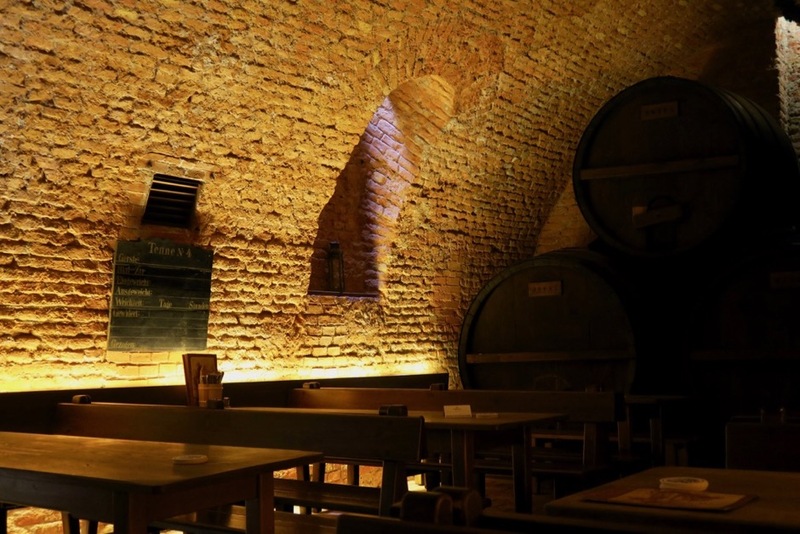 Deep underground at Augustiner’s Lagerkeller. Each night we bundled up and took to the cold streets of Munich in search of some delicious German lagers. 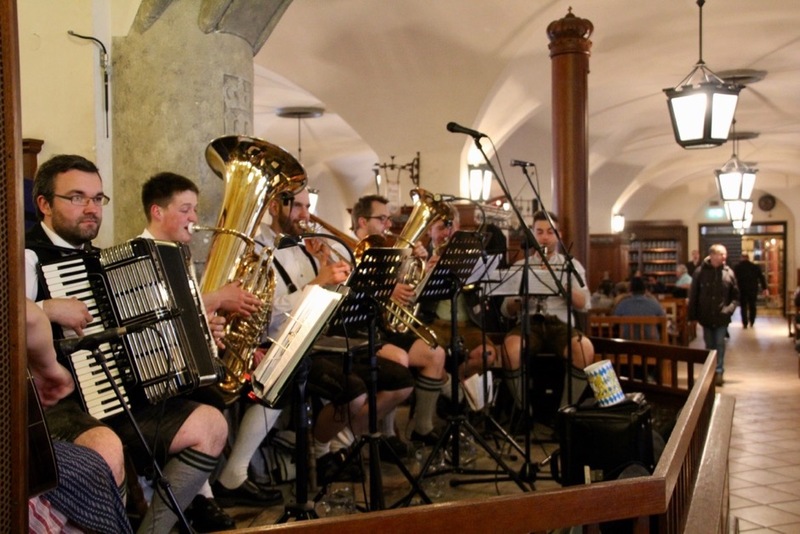 We stopped at the infamous Hofbräuhaus in the heart of Munich, dove deep underground at the cavernous Augustiner-Keller, dined on a wonderful meal at Hacker-Pschorr’s Der Pschorr, and spent night after night enjoying the heated beer garden of the Andechser am Dom. Those are the highlights of our trip but no matter where we went Helles and Dunkel filled our glasses. Oh, and if you think Surly is expansive, take a step into any major beer hall in Munich and realize that these are the rule and not the exception. A crisp winter evening at Giesinger Bräu. 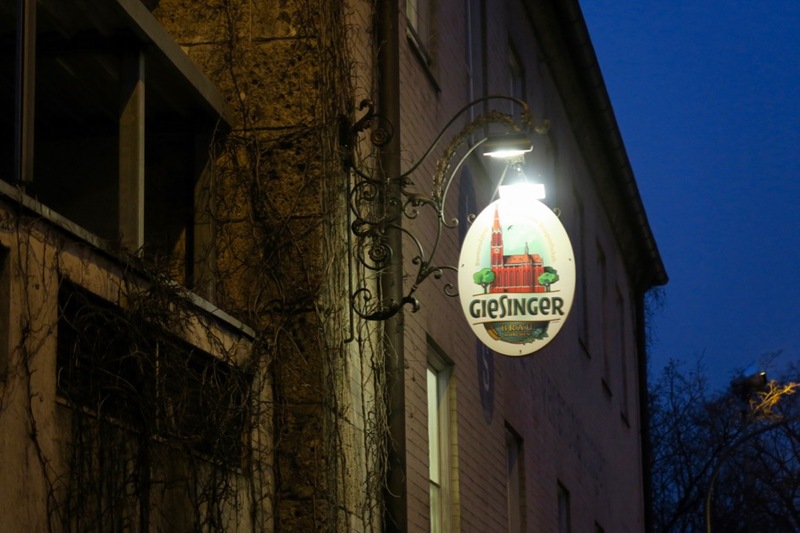 On a particularly brisk evening our group ascended the steps of the Silberhornstraße U-Bahn station and spied the green neon lights of Giesinger Bräu. This is one of the few breweries trying to push the envelope of possibilities for German beer. During our visit we’d taste plenty of bold styles, all still firmly within the purview of the Reinheitsgebot. Together with CREW Republic, whose tagline “Craft Beer is not a Crime,” puts a stamp on the desire for a younger generation to buck the trend and move on from regulations that outdate many countries, ours included. An excellent article from Michael Blanding at the Boston Globe covers the burgeoning craft scene in Munich, and more recently the Bavarian Brewers’ Association voted to restructure the purity law and chip away at legislation that is now over 500 years old. The end may now be near. Winter in the Chinesischer Turm Beer Garden. During the last afternoon of our trip we took advantage of our first taste of the sun to visit the Englischer Garten, Munich’s version of New York’s Central Park. 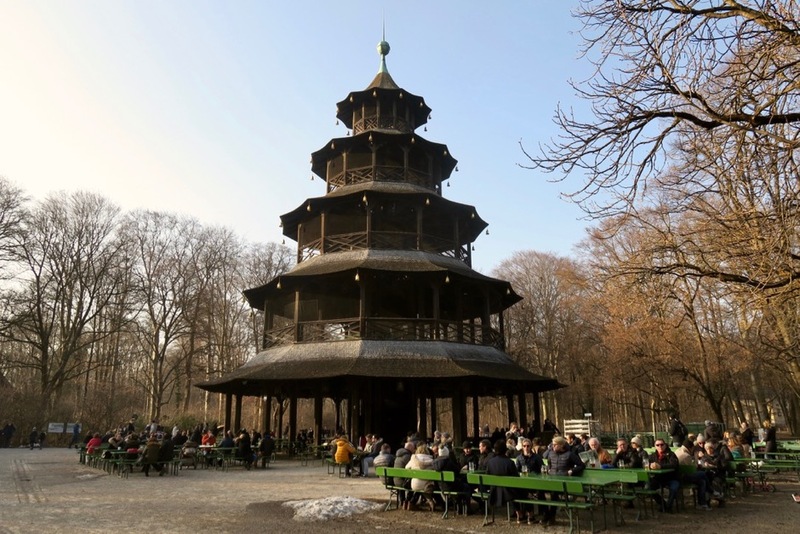 As with everything in Munich there was a beer focused goal to this trek: the beer garden at the Chinesischer Turm. Despite the sun it was still chilly so a we thought we’d just reminisce at the site where we shared a Radler in a rain drenched beer garden just two years prior. When we rounded the corner we were shocked to see hundreds of Germans, sun shimmering off their steins, and settled in to ensure the sun would set that day. As we dumped our remaining coins on the table I couldn’t help but admire the tenacity of the people stretched before us. While hundreds of years of tradition is important, I hate to see those purity laws holding their adventurous spirit back.